Hope you all had a wonderful Thanksgiving! We had a great weekend with a delicious meal enjoyed with family. Luckily I had help with dinner prep from Q, who happily helped with making dessert. We have had the kids in the kitchen from an early age. From measuring out flour or rolling out dough, there is always something for them to do to get them involved. We learned early on that if they have a hand in making a meal, they are more likely to eat it. 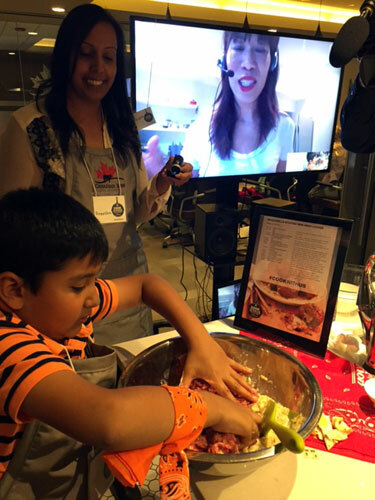 I was excited to be invited, along with Q, to the Canada Beef cooking event in partnership with Canadian Living. This was an interactive session, “Cook With Us”, that allowed us to learn from the folks at the Beef Centre, and arm the kids with basic skills to be confident in the kitchen. 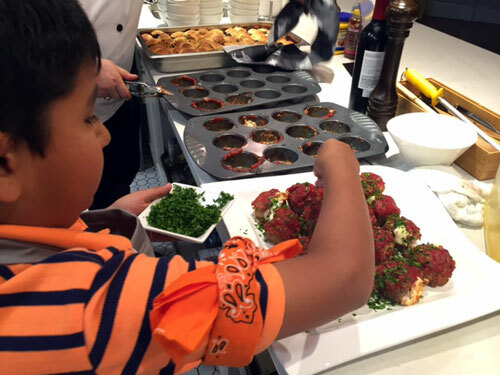 The event took place at the Canadian Beef Centre of Excellence where we were invited to cook with several other families. 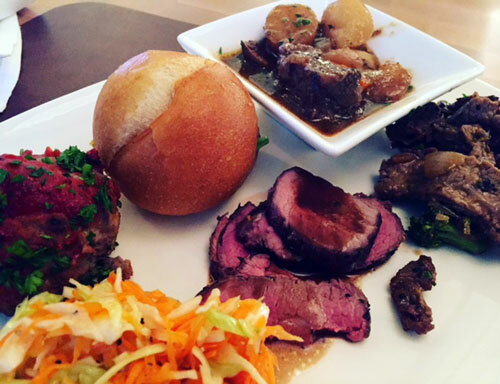 Each family worked as a team to create one course for a meal to be enjoyed by all at the end of the evening. 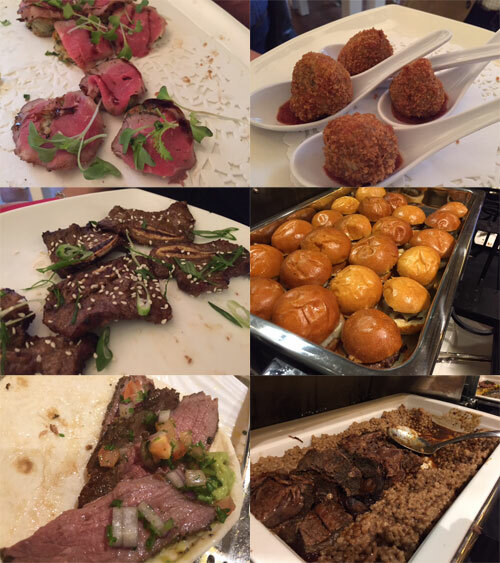 Of course beef took centre stage and the meal included meatloaf, sliders, stew, a stirfry and a roast. Q and I were tasked with making mozzarella-stuffed mini meatloaves. 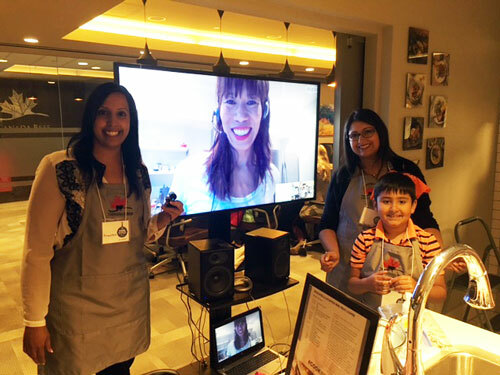 We were joined virtually by Publisher Sandra Martin from Canadian Living who helped us prepare the dish. I have to admit, I’ve never made meatloaf. Maybe because I’ve always had this perception that meatloaf is dry. Well, this sure did change my mind! The meat was super moist and the flavours were fantastic. 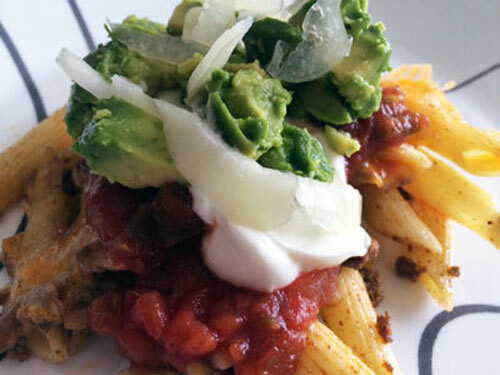 This recipe was a hit, especially with Q who made me promise that we would make it again at home. We did, and it tasted amazing the second time around as well. The October issue of Canadian Living has a dedicated feature on families cooking together along with some great beef recipes. 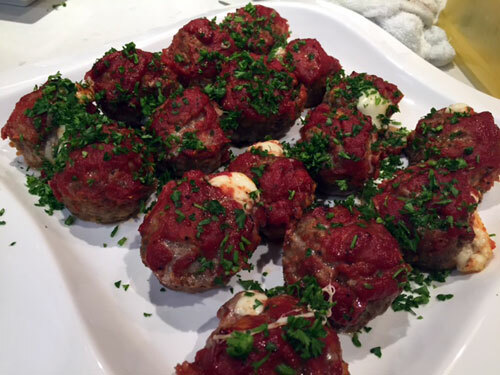 You can find the recipe for the mini meatloaves here. Thanks to Canada Beef and Canadian Living for a fun evening! It’s been a year since we have moved into our new place and this year, I was determined to have a garden. Hubby built me a box and we thought we would try our hand at growing our own food. What started out as a couple things ended up into a dozen. We planted kale, butter lettuce, tomatoes, herbs, zucchini, onions, carrots and fruit. We were thrilled when we started to see things grow and our sparse box turned into a lush garden. There’s nothing like eating from your own garden. It’s fresh and so rewarding to be eating something to you have grown yourself. The butter lettuce has been a big success, the leaves growing big and full. There’s only so much salad you can eat though and so we have been using the lettuce as wraps. These beef and mushroom wraps were a hit, with no leftovers. Adding the Korean pepper sauce, Gochujang, made Q happy since he can’t seem to get enough of it. The beef fulfilled everyone’s protein requirement and wrapping it in lettuce made us feel so great, eating a filling and healthy meal. I’m happy to be participating in another Canadian Food Creatives Collaboration. 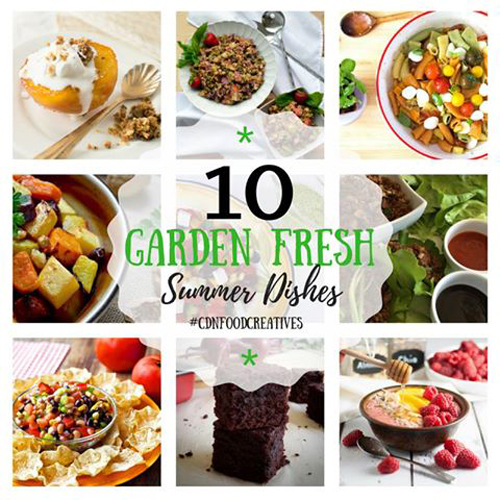 This month’s theme is Fresh from the Garden and is hosted by Cassie of Crumb Kitchen. 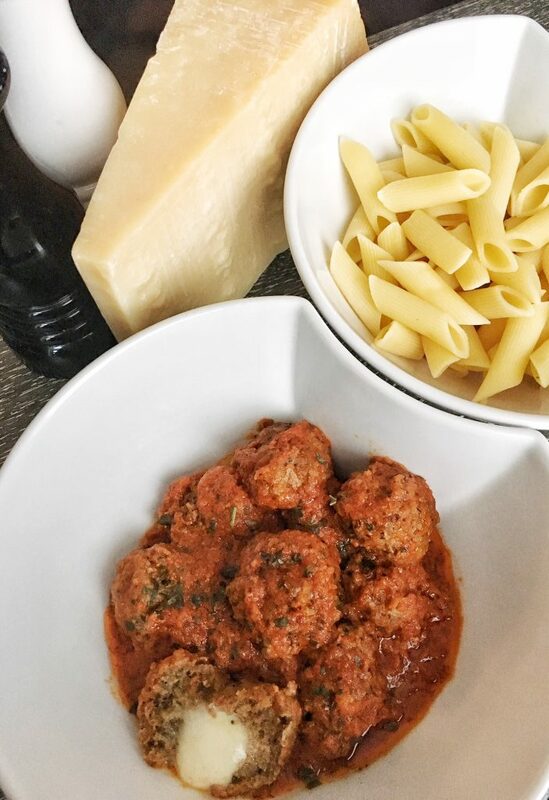 Check out all the fresh recipes and see this recipe below. 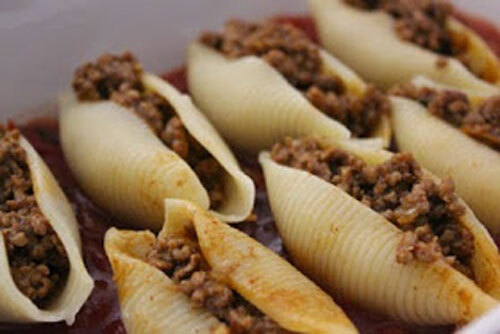 Cook the ground beef and mushrooms until the mushrooms are tender and the ground beef is cooked. Add the garlic and the sauces and let cook for ten minutes. Finish with the green onions. 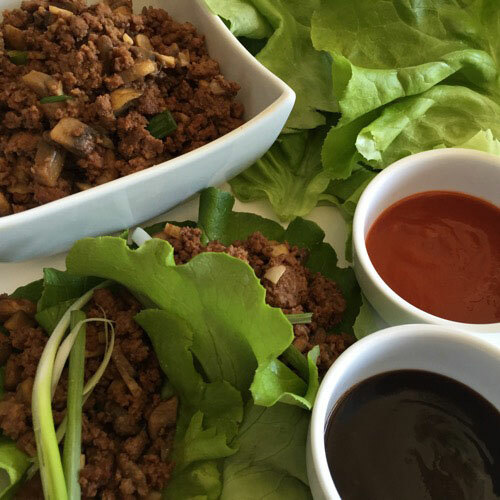 Wrap the beef mixture in the lettuce, top with more green onions and serve with hoisin sauce and Sriracha. It was a typical May long weekend – cloudy, rain and even snow! This past weekend was a far cry from the 30 degree weather we experienced the week before. You gotta love Calgary weather. Last week’s hot temperatures made us want to bbq. We really felt like having some burgers and not having any buns was not going to stop us. I had a couple loaves of garlic bread in the freezer and it made the perfect enclosure for some juicy, spiced burgers. Adding cumin and coriander definitely added the pop of flavour that I was hoping for. Combined with the buttery garlic from the toasted bread, it was a satisfying summer time meal. Combine the beef with the spices, mixing just enough to get everything mixed together. Make patties and bbq. 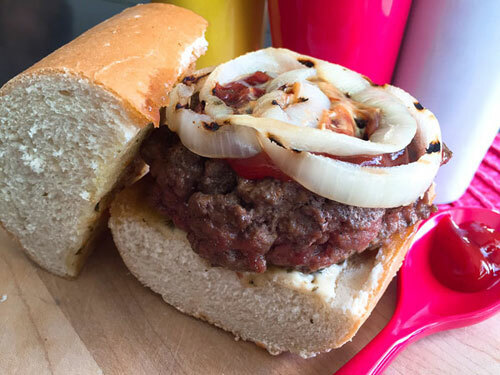 Grill the garlic bread and any veggies you want to top your burger. Enjoy! Sometimes I’m overly optimistic and I buy way too many vegetables. I plan meals that don’t come into fruition and sometimes these healthy morsels seem to get forgotten in the fridge. Stir-fries are the perfect dish to clean out your fridge and make use of all those veggies before they end up in the compost bin. Yesterday, I went to the grocery store yesterday just to buy the beef. I was determined to use up everything that was in my fridge. Sadly, the red peppers didn’t make it, but I did manage to save the broccoli and the carrots. I even used up the half bag of salad that was in the fridge – the cabbage and the carrots, even the pumpkin seeds, were perfect for a stir-fry. I dredged the beef in a flour mixture because I wanted the pieces to be a little crisp but you can totally skip that step. For the sauce, I sometimes just make a mixture of the sauces that are in the fridge, using up the last drops. 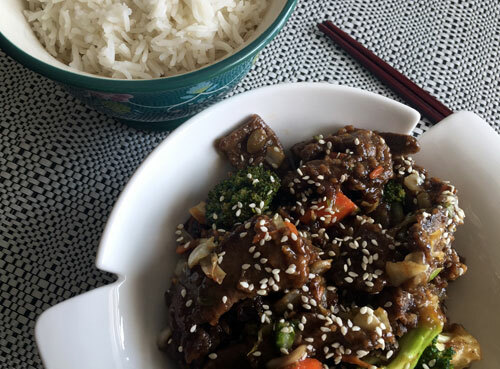 This time, I made a slight variation to the sauce from the Mongolian Beef recipe, which was so delicious. Mamma used up the veggies, the kids at the veggies, it was a good day! In a small saucepan, combine the first six sauce ingredients. Bring the mixture to a boil. Combine the corn starch with the water and add to the sauce ingredients. Let simmer until thick. Combine the flour, cornstarch, salt and pepper. Dredge the beef in the flour mixture and pan fry. This can be done in batches. Keep aside. Drain the oil from the pan and add in any vegetables. Once they are almost cooked, add back the meat and add the sauce. Perfect with rice! I love love love P. F. Chang’s. If there’s a city that I visit that has the restaurant, you can be sure that I will visit it at least once (maybe twice) while I’m there. I love the Asian dishes that they have and there really is something for everyone. 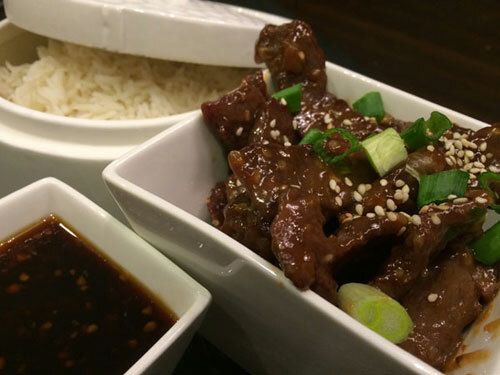 When I found this copycat recipe of P. F. Chang’s Mongolian Beef, I could not wait to try it! I am so thankful that Tiffany had it on her blog. It was easy to make and the sauce was soooo good. It was pretty close to the real thing. As mentioned on her blog, the recipe makes way more sauce than you need but it’s perfect for anything really. I still have some left over which I might use with some chicken. Until I can get to P. F. Chang’s, this dish is delicious and satisfying! Combine all marinade ingredients in a small bowl and whisk until combined. Pour into a zip-lock back with beef strips, seal and chill 1 hour or overnight. 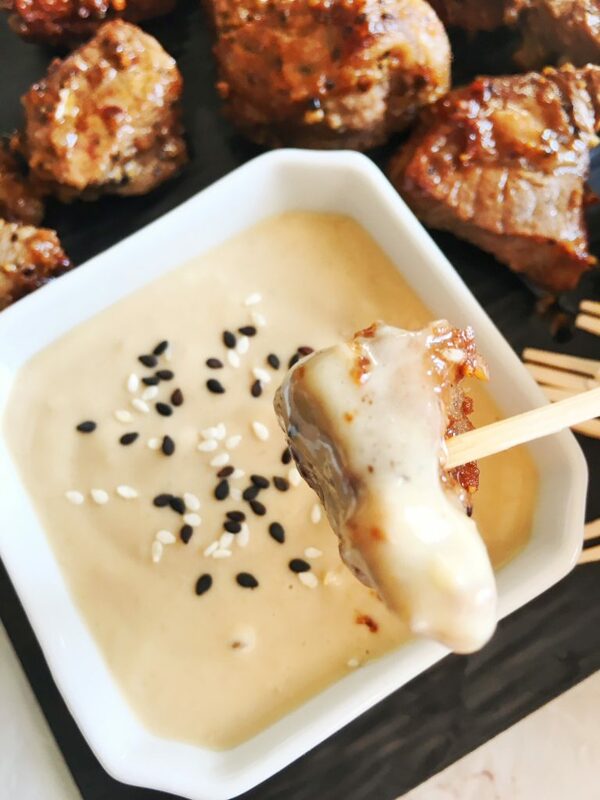 Drain marinade from zip-lock and set beef aside. 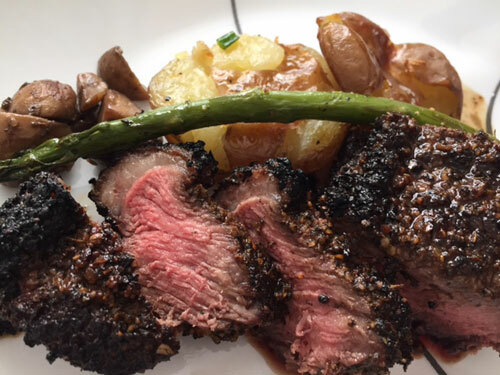 In a large pan or skillet, cook beef strips over medium high heat until cooked through (5-8 mins) turning strips over throughout to ensure even cooking, reduce heat to medium. add ½-1 cup of sauce. Stir and cook 1-2 minutes longer. Garnish with green onions and sesame seeds. 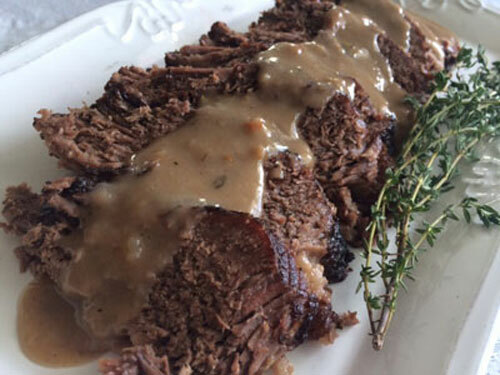 The slow cooker is always welcomed around here, especially on the weekend. It’s nice to dump things in in the morning, enjoy our day as a family and still sit down to a great home cooked meal. 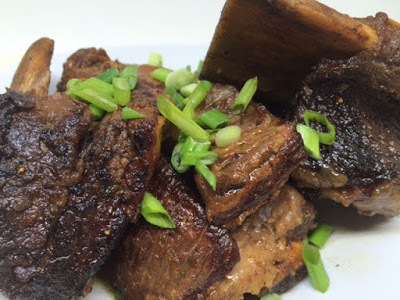 A couple weeks ago, we enjoyed these beef ribs with fig bbq sauce. These saucy ribs are tender and fall off the bone. Easy and tasty – perfect for a busy Sunday. Pat the ribs dry and sprinkle with salt and pepper. Heat some oil in a pan and sear the meat on all sides. Place in slow cooker. In the same pan, add a little more oil and add garlic and onions until softened. Add the ketchup, vinegar, fig spread and spices and cook for a few minutes. Add the water and pour the sauce over the ribs. Cook in the slow cooker on low for six to eight hours. learning together and eating beef. We had a great day learning with Master Butcher Abe van Melle and Certified Chef de Cuisine Marty Carpenter. We ended up loving the skirt steak. 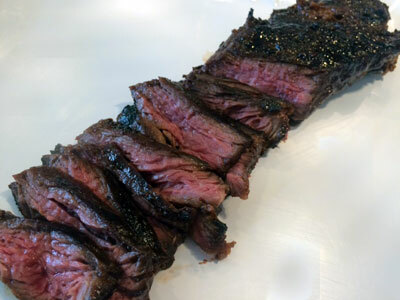 Skirt steak is a long cut from the diaphragm muscle of the cow. 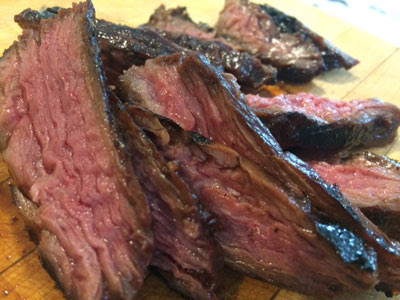 This cut has an intense beefy flavour and is now one of our favourites. before you want to grill.